Samus receives a distress call from planet SB-018, a tundra covered planet code-named "Finland". 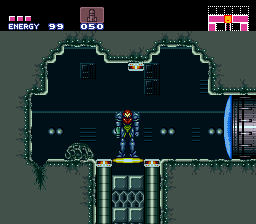 Samus finds herself within frozen caves and attempting to investigate the research facility on the planet. There has been danger - the facility has been infected with an undiscovered planetary virus, and and the facility has been cryogenically frozen to avoid the virus from spreading. 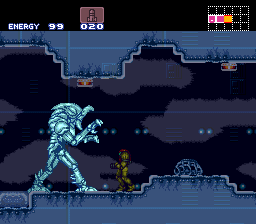 Samus must break the ice by exploring the facility and detonating the planet, so the virus can no longer spread! For the Winter Hacking 2017 contest. A decent hack for the winter contest. Throws a boss and high health/damage enemies at you early, but starting items and room state things make up for it. Not too interesting visually but it fits the freezing and thawing theme really well. Also ends kind of abruptly but that's not bad. A good quick play hack. This is a pretty solid hack. It features both freezing and thawing, and makes great use of thawed roomstates to open up previously-inaccessible areas; however the trigger that causes the thawing is not obvious. It would have been much better if the random dead-end room included something conspicuous to be destroyed, or a map station, or something else to interact with that could give the player some feedback of "something important just happened". Jiffy loves to make physics changes for seemingly no reason, and this time around we get awkward walljump arcs and a complete lack of running. There's no particular lore explanation for it, and more importantly the changes were not utilized for any puzzles or creative ways to maneuver through rooms. So it just makes the game feel slower and a bit "off". I beat Ridley on my first attempt, although it was pretty close and I'm fairly comfortable fighting him without great equipment. Players who are not skilled at that fight are sure to struggle. Proper Item Collection display: 94.0%.